If you are hosting your wedding in Thailand, it's definitely worth infusing the celebrations with a few unique traditions to create a celebration that you and your guests will never forget. The natural landscape of Thailand's islands offers the ideal backdrop for couples looking to hold a picturesque destination wedding. What's more, with wide selection of stunning venues to choose from, couples have the perfect opportunity to personalize the celebration. An increasing number of couples are choosing to introduce a few Thai wedding traditions into their big day, whether its a Buddhist ceremony or a spicy feast at the reception. Below are a few ideas to help you ‘Thai’ the knot in Thailand. If you want to get your wedding off to a lively start, then kick off the proceedings with a traditional Thai drum procession. In Thailand, most weddings begin with a procession of skilled performers, who can be sourced by your wedding planner, and usually comprise dancers and drummers, all of whom are clothed in a bright rainbow of colourful Thai silk costumes. Guests can marvel at the spectacular scene before joining in themselves, as the groom leads the way to the bride so the official ceremony can begin. If you are a spiritual couple and want your wedding day to reflect that, then a Thai Buddhist ceremony may be the right choice for you. Traditionally, an odd number of monks make their way to the wedding venue early in the morning to visit the couple who are preparing to marrry. The ceremony begins with chanting and prayers, and a floating candle is placed in a bowl of water that is later used to bless the couple with good luck. Once the prayers are over, the bride, groom and guests make offerings of food to the monks for good luck. 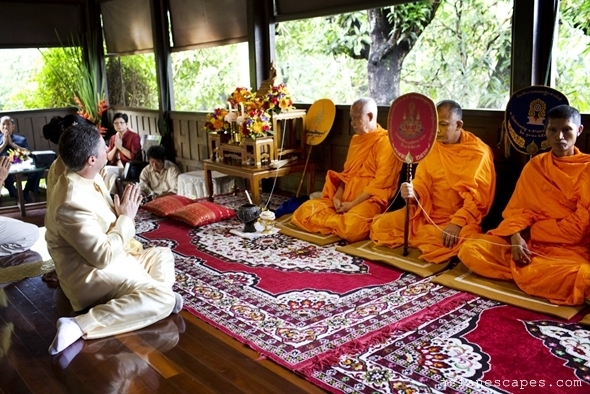 Finally, the senior monk blesses the new husband and wife and the monks eat before returning to the temple. In Thailand, the union between a bride and groom is not official until the pouring of the water has taken place – a highly symbolic act in Thai weddings. The bride and groom are seated at dedicated water pouring bench, known as Dtang Rot Naam, and connected by a ceremonial string headdress that symbolises their union. The couple then press their palms together in the Thai ‘wai’ position, over a tray. Each of the guests at the wedding, starting with the elders, then takes it in turns to pour a trickle of water from a conch shell over the bride's and groom's hands to bless their marriage. If you are hosting your wedding in a private villa, you have plenty of space for a few fun wedding games, which will likely be among the highlights for your guests. In one traditional Thai wedding game, the bride hides – traditionally somewhere her parents’ home – but it can easily be in a rental villa. 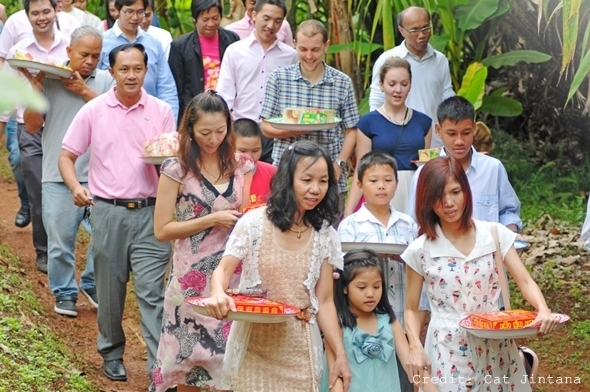 The guests then take a short stroll away from the property carrying gifts such as fruit and cakes. They are led back to the property by the groom, whose job it is to seek out his new wife so that she can be presented with the gifts for their new marital home. There are few global cuisines that can offer the range of flavours and nuances found in Thai food and couples hosting a wedding at one of Thailand’s private villas can hire the services of a personal chef to whip up a buffet of Thai masterpieces for their guests to enjoy. A wedding buffet packed with exotic dishes will inspire guests and even act as an ice breaker at the dinner table. Whether it's a spicy coconut curry or a little sweet and sour grilled fish, Thai cuisine has a bounty of flavours to suit everyone's tastes. "The Signature Weddings is a bespoke destination weddings service offering a wide range of options to couples. However, some of the products and services mentioned in the blog articles on this page may not be available as part of the Signature Weddings' service." Why choose a Thailand marriage? Why hold a Wedding in Thailand? What makes a Koh Samui Wedding the perfect choice? Why do couples choose Weddings in Thailand? Copyright © 2008 - 2019 Island Property Services Co., Ltd.
All content and rights of this web site are copyrighted and reserved. Any use of any part (text, logo or pictures) of this website for direct or indirect commercial gain is prohibited without our prior consent. The Signature Weddings is a trademark of Island Property Services Co., Ltd.